Like any amazing father, I'm super involved in my kids' gaming life. I play along. I join the Lego adventures and play the coop companion. I encourage and support, I look up cheats and hints. That's good parenting, right? Yes it is. Usually, we're playing something we got into together (my all-time favorite coop: Portal 2), but Zev has started bringing this own tastes into our gaming. Skylanders Giants was all the rage with the second graders for a while, but that's worn off (plus, we beat it in like 2 weeks, and only fully upgraded one giant). So now he's brought Minecraft into the house, and it's taken over everything. The thing is a virus. A truly awesome and social and brain-bending virus, but still. We both have worlds going on the Xbox. It's on the iPhone, all the time. He's watching YouTube clips of advanced gameplay and elaborate (and very well done) music videos recasting pop songs into the Minecraft universe (loving "Some Items That I Used to Own"). He makes up his own songs now, too, and shares everything he learns about the world, constantly, with all the other boys in the second grade. 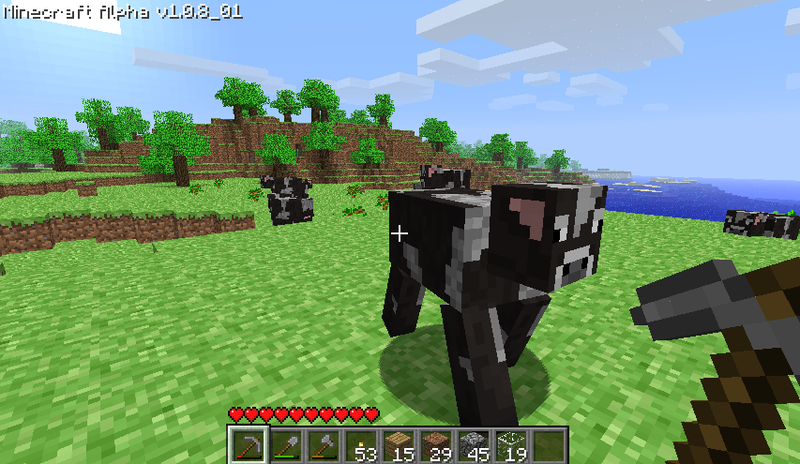 And that's the best part of the whole game for me: All the good stuff to know about Minecraft, you hear from friends. (Well, in my case, the wiki or the book.) And what could be more social than that? This is how I even know anything about Minecraft, from all the second-grade gossip. It's not like the game tells you that you need to build a portal to hell, and collect some eyes, and find a hidden fortress, and defeat a dragon. The casual player would have no idea. At all. Not a clue. But the kids all know this, and they obsess about it and talk all about it, so now I do, too. My wife calls it the game where I break rocks and kill cows, and that's true. There is a lot of breaking of rocks and killing of cows. But there's also fighting zombies with pig faces, and building flying castles, and…breaking rocks. But I finally made a diamond sword, and I'm collecting obsidian (it's hard!) for my Nether portal. Zev's keen on making an iron golem and building an underground city and only occasionally loses track of his house and gets so upset he can't play for a few days. We have goals, agendas and we know how to get there. Hard work and patience. Again, good parenting, right? Minecraft is good but how about Roblox? There are great resources out there like RobloxHelper. Kids will really find it useful.